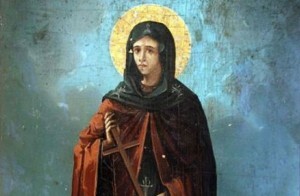 Orthodox Christians and Serbian Orthodox Church celebrate the day of Saint Petka (Sveta Petka), protector of women, the sick and the poor. Believers turn to prayer for help and safety from a disease and other life troubles. The cult of St. Petka has been cultivated for centuries in South East Europe, and is respected by some non-Christian people on the East. Near St. Petka temples can often be found mineral springs that people drink from, believing that it will heal their wounds and protect them from diseases.